This is generally well-written, if poorly proofread. But the science/technology seems wonky. And the main character, Dr. Cooper Barnes, M.D., the civilian Chief Medical Officer of the International Space Program’s ISP Frontier in 2065, is surprisingly negatively introduced. Most novels with a medical protagonist state their long-range goal of eliminating disease and putting themselves out of business. Cooper complains on the first page that the last serious disease, ebola, has just been eliminated, and he is out of a job. When he is asked to become the head doctor on an exploration spaceship that will land on new planets with unknown diseases, he asks for medical supplies and trained assistants that are presented as arrogant demands rather than requests. You can guess that Cooper does not have a good bedside manner. Novels that feature unpleasant main characters that gradually become likeable are hard but not impossible to bring off successfully. Think of Ebenezer Scrooge in A Christmas Carol. Unfortunately, M. Andrew Rudder is no Charles Dickens. You have to take it on faith, and the reviewer’s promise, that Cooper Barnes will become a better man. Argyll Productions, July 2013, hardcover $24.95, trade paperback $17.95 (215 [+ 1] pages), Kindle $7.99. After a beginning like this, it is a surprise to learn that Cooper does have friends. The closest is a member of the only aliens that Earth has discovered so far. Cooper is semi-resigned to becoming a general doctor aboard an exploration starship instead of a medical specialist on Earth. At least it keeps him employed in the medical profession. But it’s not what he expects. Cooper has been proud of being ignorant of anything not related to medicine, and his detailed tour of the newly-built Frontier, with the latest in both human and Qinan technology, will fascinate all techno-geek readers. All Earth is excited about the mission of the ISP Frontier, which is the first starship to have a mixed human-Qinan crew, built with Qinan f-t-l technology since Earth had not developed a faster-than-light drive before the Qinans arrived. ‘This is Chief Diplomatic Officer Sara Patil,’ he [Captain Abdel] said, gesturing to a woman at his left. She was of Indian descent, and like him, she kept her hair long. ‘She is here representing the Armstrong Lunar Colony.’ Good to know that non-Earth humans were also being included, Cooper thought. She was smiling, but whether or not because of the cameras or out of actual excitement to be here, he didn’t know. Cooper’s shipmates are introduced in colorful detail that also smoothly expands the depiction of this futuristic technology. In fact, the tech-talk goes on for so long that it raises some questions. The cameras make sense for broadcasting while the Frontier is in Earth orbit, but once the f-t-l engines are turned on and they are “out of the solar system in an hour”, what can the cameras be used for except viewing their immediate vicinity when they reach a new planet? Recording what they encounter on their voyage for playback when they return to Earth? Otherwise it seems wasteful to install the fancy cameras for just the publicity broadcast of the Frontier’s launching. I would hope not. There is a big difference between f-t-l travel and f-t-l communication. All Alone in the Night does not mention f-t-l communication between the exploration starships or between any of them and Earth. How do the starships with f-t-l engines communicate with Earth, and each other? For all the flashy futuristic technology in the background, I could not help thinking of the notorious line in the first Star Wars movie when Han Solo boasts to Obi-Wan Kenobi that he made the Kessel Run in only twelve parsecs. That pretty much confirms that there is no f-t-l communications. The starships have to meet physically to exchange messages. So how is data sent back to Earth without it taking tens of thousands of years to arrive? ‘Why’d they go down to a planet without environmental suits on?’ Sykk asked. ‘If they’d been there longer than an hour, they’d be dead.’ There was a small green flash in the corner of the monitor. Before he could change the display, Helmsman Richards’s face appeared on the largest screen. He was in his mid-twenties, and for some reason had blue hair. Cooper supposed once you reached a certain professional level in any field, people stopped commenting on your personal life. What was the expedition’s training (excluding the medical personnel)? Watching all the original Star Trek episodes? Is the Frontier an exploration starship or an officers’ club? If the Chief Medical Officer recommends against all smoking, why isn’t smoking banned altogether? All Alone in the Night moves briskly, but with a casualness and a reckless naïveté. I may be obsessing on scientific-technical minutiae that do not really affect the plot, but considering the emphasis on how "scientific" everything looks, they spoil the s-f illusion for me. All Alone in the Night works best if you read it like a Star Trek novel and don’t worry about the astrophysical details. A similar disappointment to me is that the Qinans – indeed, all the new aliens that the humans meet in the first pages, such as the human-looking plant-men of Scerisa -- are cosmetic aliens only. Sykk likes to watch old Earth movies while snacking on large tubs of heavily buttered popcorn. Kirano Faer, the Qinan Communications Officer, talks idiomatic English sprinkled with curses in English, French, and Arabic besides Qinan swear words. 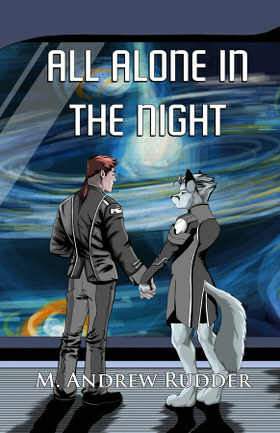 Despite their anthropomorphic white fox appearance, with their fluffy fur, wagging tails and twitching ears, the Qinans act so human that nobody is surprised that Cooper and Sykk are openly homosexual lovers, as the excellent cover by Soro shows. …they still act just like humans. Again, this is standard for Star Trek-level s-f, where all aliens, no matter how exotic they look, have to be human actors in makeup and costumes. This may be unimaginative, but there is a lot of it. Neither the science, the medicine, nor the technology are the main focus of All Alone in the Night. Each alien species that the Frontier meets has some medical emergency (some very bizarre) that Cooper solves almost immediately. As a result, the aliens want to deal only with Cooper or the Frontier’s medical personnel, which increasingly irritates Captain Abdel and the Frontier’s non-medical staff. Cooper finally realizes that the ISP, which has been growing increasingly bureaucratic and militaristic in his opinion, has been planning to take the leading position in diplomatic negotiations with all alien species that they meet; and an outright military posture with any aliens that look like they could stand up to the ISP. Cooper’s helpful non political/bureaucratic attitude is giving the aliens an alternative with which to deal. Cooper, who is not interested in anything except medical matters, suddenly finds himself the de facto representative of humanity to an expanding portion of the galaxy. Whether he likes it or not, Cooper has to spend more time in first-contact ceremonies representing Earth, being extra-cautious to avoid doing anything that might be considered as insulting or hostile by the unknown aliens. When military disaster eventually happens offstage, it is up to Cooper to recommend whether Earth should mobilize on its own, discarding its tentative relations with apparently-friendly aliens; or form a defensive alliance with those aliens, even though one may be a disguised aggressor – despite being way out of his depth. Everyone is counting on him, and Cooper feels All Alone in the Night. 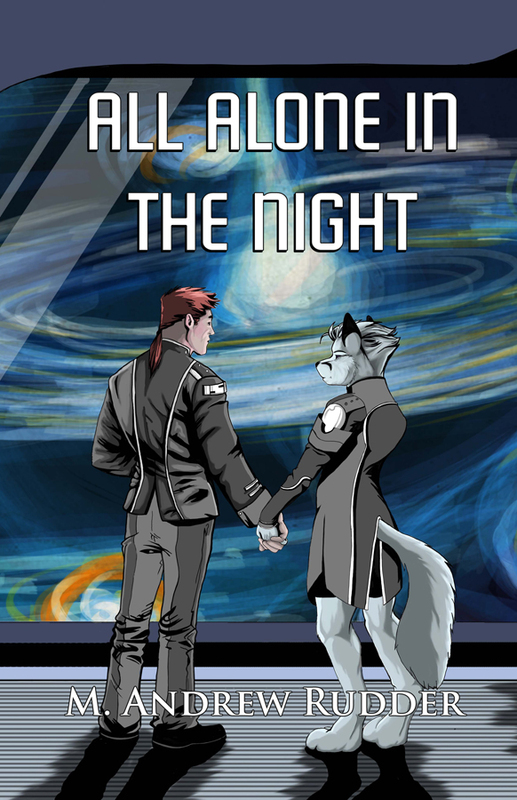 All Alone in the Night is a fast-paced, simplistic but colorful s-f novel, with a human protagonist and many different-looking but human-acting aliens in the background. I can live with most of the obvious proofing errors, and Rudder’s constant ignorance of singular/plural pronoun agreement (“…a person was only isolated if they wanted to be.” – p. 59), but is Sykk’s homeworld Qina or Qinan? On page 12, it says both, “The walls were covered in photographs, both of Qina and Earth.”, and, “ … except for one on a glacier on Qina, with him in a fur-lined coat being miserable but smiling all the same.” But on page 14, it says, “… wasn’t that kind of the point of Qinan having an embassy?” Which is correct? The novel ends with a setup for a sequel. Yeah, despite my whining, I'll look forward to it. The Kessel Run is normally 18 parsecs long, due to the requirement to avoid a cluster of black hole (the Maw). By having a faster navigational computer, the Millennium Falcon could get to the same point in 12 parsecs (per Lucas's DVD commentary). Of course, this is probably a retrospective fix to a technical error, but I guess it's still canon. Perhaps the only retrospective fix Lucas ever did that is worth it. It sounds like a fun, interesting take on a premise that seems fairly overdone ("furries in space"). It has some good classic precedent. The first one that comes to my mind is the Med Service series by the very distinguished golden age sci fi writer Murray Leinster. I'm sure you're well familiar with him Fred! I haven't kept up with sci fi after getting a decent grounding in it in the 1990's. Has anyone done any notable "medical science fiction" more recently? I don't ordinarily have time for fan fiction. This review attracts a comment at least. Nothing wrong with fun, light, pulpy star-trek style fiction. I'm not familiar with any more recent medical science fiction of the "space veterinarian" type. I used to love L. Ron Hubbard's Ole Doc Methuselah stories. It's a pity for s-f's sake that he went all serious with Scientology after 1950 -- although he did so at just about the time that s-f was becoming more seriously literary. It's intriguing to ponder whether he would have continued to be one of s-f's leading writers once it evolved past its "evil space emperor" space opera days. Actually, Murray Leinster's Med Ship stories have become noticeably dated. I can't think of any of his stories that would be called anthropomorphic -- his space vet hero was a doctor to dumb animals; either Terran animals imported to other planets, or alien unintelligent animals. His solution of killing off a planet's dangerous native animals and replacing them with Terran animals bioengineered to be friendly to humans would not be considered at all environmentally friendly today. The Irish author James White's galactic hospital stories are still readable today, although like most s-f authors who have died, most of his stories are out of print now. He was not really a "space veterinarian" author, either. His patients were all intelligent alien species, as I recall; exotic peoples but not exotic animals. He also favored the viewpoint of the human doctors in interstellar medicine. His stories may have had intelligent anthropomorphic patients, but they were supporting characters to the human doctors and nurses. I kind of want to see "SPACE COOKS!" In a world where chocolate and onions are both common food items while at the same time deadly poison to our two most common companion species, can you imagine trying to keep a crew of multi-species both nutritionally balanced yet palatable while not accidentally poisoning anyone with salt or something? Actually, I think "space cook" and "space doctor" would have to work closely together, if not be the same thing. Cory DuPlessis, the wolf head cook of the interstellar freighter "Tai-Pan" in the anthropomorphic "Tales of the Tai-Pan Universe" series, run by most of Seattle Furrydom since 1988. Isn't a new issue due about now? Cory is the only memorable space cook whom I can think of, not counting "Cookie" in the 1956 "Forbidden Planet" movie. I was highly amused when I read, within a week of each other, an American s-f novel that described Coca-Cola as Earth's greatest contribution to galactic culture, and a British s-f novel that described tea as Earth's greatest contribution to galactic culture. Just imagining now the slugmen eating a sodium rich snack product and dying a horrible death by dehydration. Memorable space cooks? How about Emily, from Mary Lowd's Otters in Space series? Or Shockeye of the Quawncing Grig? This story reminds me of the greatest science fiction/medical series I have encountered, the Sector General series by James White. The 'main character' (though not the main protagonist, I won't say more to avoid spoilers)was a "fish out of water" guy who was difficult to like, and had a slow progression to success in a highly competitive (and dangerous) environment. The other character I allude to was a complete a**hole, until the amazing reveal/resolution. It all worked very well, though it took several books. Trying to do something similar with less development/words would be tricky. I'll have to check this story out myself. Oh, and possibly the best "space chef" I have encountered was in the same series. I highly recommend the Sector General series if you enjoy sweeping epic SF that could also be considered furry. I echo your praise of White's "Sector General" interstellar doctor stories 100%, and I am glad to see that I was wrong about most of them being out of print today. In the original editions, yes; but there are new editions available on Amazon.com. They are definitely worth reading. I am reading Maggie Hogarth's "Mindline" right now, and enjoying it very much. Look for a review of it here soon. I am almost afraid to reread L. Ron Hubbard's "Ole Doc Methuselah" today. Will it still hold up as well as I remember from the 1950s? Those 639 uniformed skeletons dangling from the trees -- brrr!